Visit the film’s official website for advance previews: www.fatalflawsfilm.com. Download a screening poster for your event (8.5″ x 11″ OR 11″ x 17″) fillable in Adobe Acrobat Reader (free to download here). We are now distributing the educational version (56-minutes) which has closed captioning in English + French/Spanish subtitles. Click here to order a digital copy (80 min version only) for $30 USD or rent for $5 USD through Vimeo. The Fatal Flaws companion pamphlet is designed to reinforce the film’s message. It is 4.25″ wide x 8.5″ high. You can preview a low resolution version by clicking here: OUTSIDE / INSIDE. 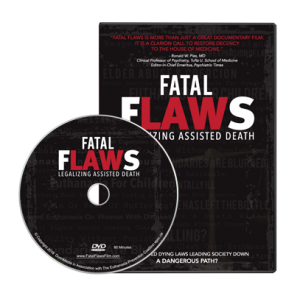 With any Fatal Flaws order, include The Euthanasia Deception documentary for $20. To order, use the appropriate PayPal “Buy Now” button below. Be sure to double check your selection before submission. If you are ordering from the USA, please select the U.S. Dollar (USD) option. *Please note: If you experience any technical difficulties with the buttons, please call us directly to place your order: 1-877-439-3348. We apologize for any inconvenience. To book a screening or donate to the production of this film & others like it, call 519-439-3348 or toll-free 1-877-439-3348, email info@epcc.ca or use the “Donate” button above.